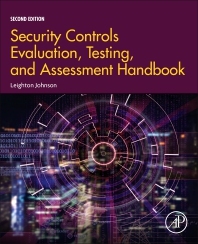 Security Controls Evaluation, Testing, and Assessment Handbook, Second Edition provides a current and well-developed approach to evaluate and test IT security controls to prove they are functioning correctly. This handbook discusses the world of threats and potential breach actions surrounding all industries and systems. Sections cover how to take FISMA, NIST Guidance, and DOD actions, while also providing a detailed, hands-on guide to performing assessment events for information security professionals in US federal agencies. This handbook uses the DOD Knowledge Service and the NIST Families assessment guides as the basis for needs assessment, requirements and evaluation efforts. Digital forensic professionals and analysts, information security professionals, researchers, and practitioners. Leighton Johnson, the CTO of ISFMT (Information Security Forensics Management Team), a provider of cybersecurity & forensics consulting and certification training, has presented computer security, cyber security and forensics lectures, conference presentations, training events and seminars all across the United States, Asia and Europe. He has over 40 years’ experience in Computer Security, Cyber Security, Software Development and Communications Equipment Operations & Maintenance; Primary focus areas include computer security, information operations & assurance, incident response & forensics investigations, software system development life cycle focused on testing of systems, systems engineering and integration activities, database administration and cyber defense activities.